Saudi Arabia’s maritime and logistics sector is set to provide a host of fresh investment opportunities that will enable the kingdom’s integration into the regional and global economies at the 2nd Saudi Maritime Congress, in March, in Riyadh. The event will take place on March 11 and 12 at the Four Seasons Hotel Riyadh at Kingdom Centre. Saudi Arabia’s looks to integrate into the regional and global economies as a hub connecting three continents – Asia, Europe and Africa, and positioning the country as a global logistics hub. In fact, the country is on an aggressive growth and diversification path, seeking completely to transform its economy and reduce dependency on oil exports in line with ‘Vision 2030’, said a statement from the organisers. This growth and diversification will be achieved through a range of measures and an integral part of the plan is to seek greater contribution from the private sector to the national economy and to attract foreign direct investment opportunities. The event will bring together leading figures from the shipping industry to discuss the effect the ambitious Vision 2030 programme will have on the Saudi economy and how shipping and logistics sectors will contribute to this project. Held under the patronage of Saudi Ports Authority (Mawani) and in partnership with Bahri, Saudi Maritime Congress will bring together leaders from the kingdom’s shipping, ports, ship construction and offshore marine companies, as well as their international partners, to learn, network and explore new opportunities. “We would like to emphasise the importance of this event to us, which has established itself as one of the most important highlights of the maritime industry calendar. The Congress offers a valuable platform to discuss the latest developments and trends in the shipping industry and highlights Saudi Arabia’s milestones in its evolution as a leading maritime hub in the world,” he said. “At our company, we are delighted to be reinforcing our commitment to connecting economies and future-proofing the maritime industry through our partnership with Saudi Maritime Congress and look forward to you joining us in March to drive forward the goals of Vision 2030,” he added. 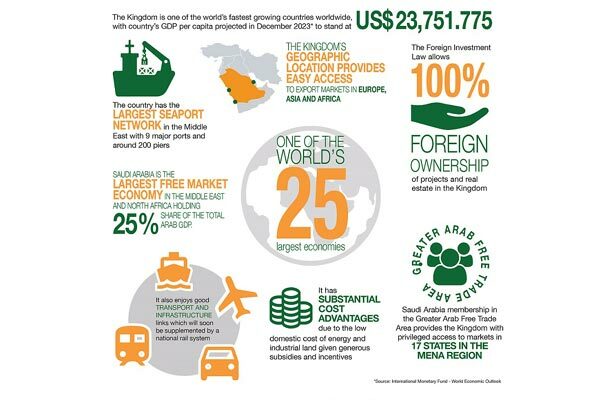 Saudi Arabia is one of the world’s largest economies and is the largest free market economy in the Middle East and North Africa holding 25 per cent share of the total Arab gross domestic product (GDP).